PUNE: NorthEast United lifted themselves to second on the Indian Super League table with a 2-0 win over FC Pune City on Tuesday at the Shree Shiv Chhatrapati Sports Complex in Pune. 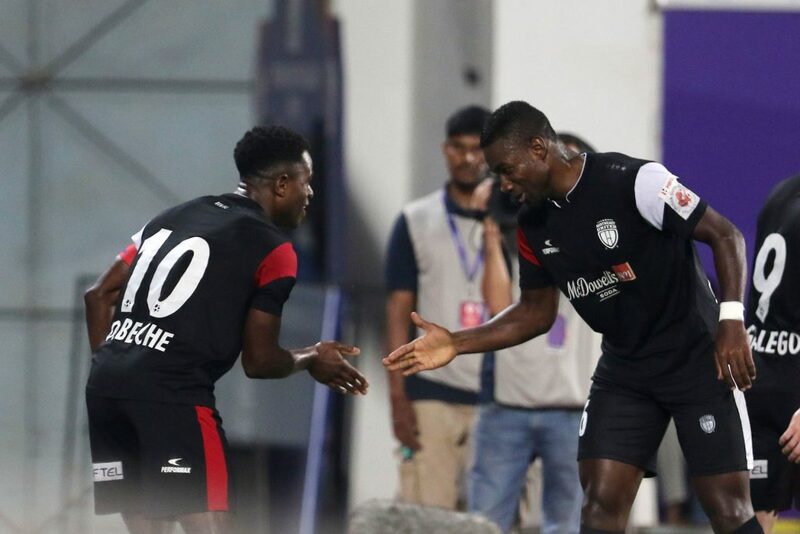 Goals from Bartholomew Ogbeche (23′) and Juan Mascia (90+1′) secured the victory for the Highlanders, taking them two points adrift of leaders Bengaluru FC. While FC Pune City remain 8th on the table with 5 points. The opening 10 minutes was a rather scrappy affair, with both teams unable to hold onto the ball long enough to create any decent scoring opportunities. The first effort on goal only came in the 9th minute, when Ogbeche won the ball from a Pune defender on the left flank. The Nigerian had a chance to shoot by himself but decided to pass it to Mascia who tried to shoot but a defender blocked it away. Three minutes later Pune City came bitterly close to taking the lead through Ashique Kuruniyan but his first time shot was superbly saved by the NorthEast custodian Pawan Kumar. Pune City had another chance in the 16th minute when Iain Hume from the right-hand side nicely squared a pass to Marcelo Pereira who tried to round the defender but slipped and it has been cleared away. NorthEast, thereafter, continued to press on, and it was no surprise when they took the lead in the 23rd minute though Ogbeche. Federico Gallego crossed it flat from the corner. It went past everybody at the near post and fell to Ogbeche who chested it down and slotted into the far post. From the goal onwards, NorthEast dominated the proceedings, but poor decision-making let them down in the final third which saw Eelco Schattorie’s charges went into the breather with only a solitary goal lead. Pune City showed intent after the interval as they made more box entries in their quest to score the equaliser and the Stallions nearly found it at the hour mark when Mato Grgic’s long throw inside the box found Marko Stankovic who took a first time shot with his right foot only to be blocked by Gurwinder Singh. Despite being under the pump, NorthEast managed three shots on goal but none of those were on target to test Kamalpreet Singh in goal for Pune City. Pune City then continued to dominate proceedings but they were repeatedly frustrated by good defending. Despite the momentum turning in Pune City’s favour, NorthEast managed to found the all-important insurance goal though Mascia who converted from the spot after Sahil Panwar clumsily tripped him inside the box and referee pointed to the penalty spot. Mascia took on the responsibility of the penalty and placed it nicely to the left of the keeper to secure a vital win for the Highlanders.